WoW Patch 5.2 Rise of the Thunder King is due for release imminently. Here’s a chance for you to check out the trailer for the latest patch and also brush up on your lore, who is the Thunder King and what is this patch all about? Lei Shen of the Mogu was fluent in the ways of war in his youth, but unlike other Mogu he also had wisdom. Once he came of age and commanded his own legions Lei Shen took his followers where no-one had dared go before, the Thundering Mountain, it was here that it is said that he took on the Mogu God with the help of an ancient artifact and tore it’s heart out, by doing this he gained power over wind and storm declaring himself to be The Thunder King. With his new power, the Thunder King rose to power by eliminating his rivals one by one (The Mogu Way), he was ruthless to his enemies when they did not submit to his will, but in him the Mogu saw purpose and direction, and they followed him, enslaving the other races of Pandaria; Jinyu, Pandaren and Hozen. Lei Shen unified his people and those he could not force to submit he found other ways to motivate them to do his will. He was particularly hard on the Pandaren because in them he saw great potential, their leaders were executed and all Pandaren art and literature was burned. In order to protect the ancient artifact that had helped Lei Shen rise to power as Emperor of the Mogu and the other races he ordered the construction of the Mogu’shan Vaults to contain the powerful weapon. One of the races that Lei Shen knew would be useful to him was the troll empire of the Zandalari, this tribe of trolls helped the Mogu when the Pandaren staged an uprising years later and since that uprising the Mogu have been scattered. Lei Shen eventually died of old age after his armies fought with monks in the Vale of Eternal Blossoms. It is said that in his final moments, Lei Shen summoned a storm that blanketed the vale for several days. Recently however the Zandalari along with the other troll tribes have allied themselves once again with the Mogu, together they found Lei Shen’s body inside the Tomb of the Conquerors, alongside his army. They took the body to the Isle of Reckoning and resurrected him with the help of prophet Khar’zul. It is in patch 5.2 that we see Lei Shen make his return to Pandaria. The Alliance and the Horde must stop him and his allies which culminates in the new raid ‘Throne of Thunder’. 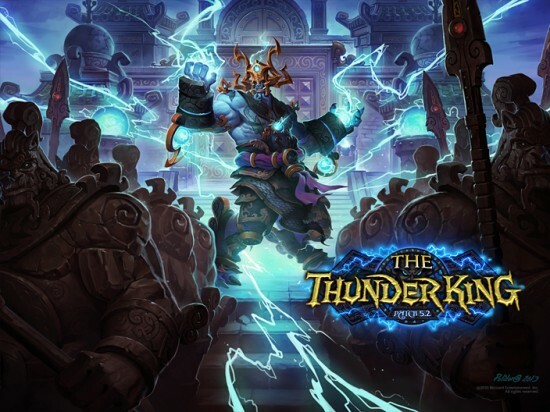 For more information on the latest patch check out the ‘The Thunder King Round-Up’ at: http://www.battle.net/wow/en/blog/7407623. You can also pick up Blizzard’s Thunder King wallpaper here: http://www.battle.net/wow/en/media/wallpapers/patch?view#/the-thunder-king. Next time, I’ll be taking a looking at Firefall and catching up with the latest developments.